Israel's UN ambassador says it's critical to bring UN delegations to Israel to see for themselves the situation on the ground. Danon argued that bringing ambassadors to Israel would help garner support in the international body often admonished by Israeli leaders for its purported bias against the Jewish state. Yet Danon said he remains “optimistic even about the UN,” arguing that there is a shift in the attitude towards Israel. He cited the resolution proposed by former US Ambassador Nikki Haley to condemn Hamas which governs the Gaza Strip for firing rockets at Israel. Although it failed to pass due to falling short of the two-thirds majority required for adoption, Danon called the resolution a “success” after 87 member states in the General Assembly of the UN voted for it. 58 countries opposed the measure and 32 abstained. He said there were a few governments in Central America and Eastern Europe in talks with Israel to follow the US decision to move the embassy to Jerusalem. So far only Guatemala, the Czech Republic, and Honduras have followed suit. 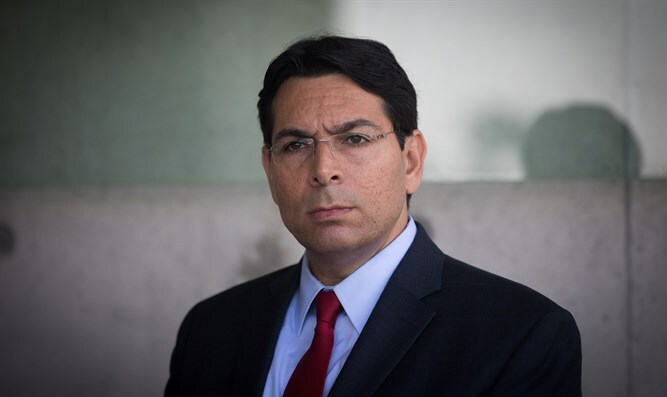 “The Palestinians are conducting a diplomatic terrorism, instead of negotiating, talking with us, with Israel or the United States,” Danon said, criticizing their refusal to engage with Trump’s long-promised peace plan.